The International Space Station (ISS) is now 20 years old. In this post I’ll talk about the history of the ISS and other space stations, and I’ll also touch on some of the politics involved. Although America was the first country to put a man on the Moon, the Soviet Union led the way in long duration spaceflights and was the first country to launch a space station, where humans could live and work for longer periods of time. Before the advent of space stations, astronauts were confined to cramped space capsules. The first ever space station Salyut 1 was launched into space in April 1971. It weighed nearly 20 tonnes and had a pressurised volume of 100 cubic metres, in which cosmonauts could live and work. This was vastly more than previous spacecraft. For comparison, the command module in which the Apollo astronauts were confined on their journeys to the Moon had a pressurised volume of only 6.2 cubic metres. 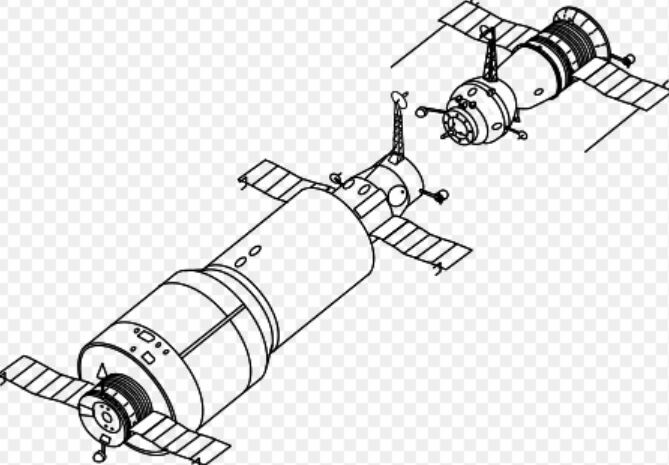 Salyut was a single module space station; the entire structure was put into orbit at once. There was no in-orbit assembly. 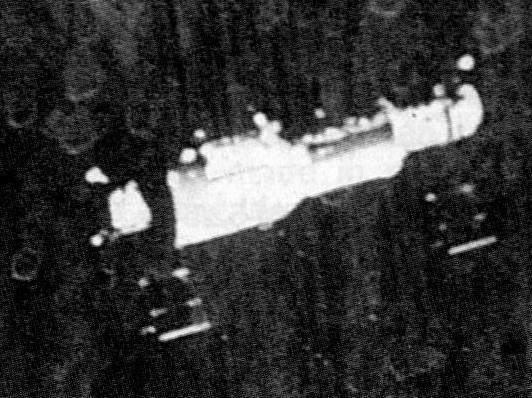 A Soviet Soyuz spacecraft about to dock with Salyut – image from NASA. Three cosmonauts from Soyuz 11 visited Salyut 1 during the following June and stayed there for a record breaking 24 days. Sadly, the mission ended in a tragic accident. In the early Soyuz spaceflights, the capsule the cosmonauts returned to Earth in was so small that there wasn’t enough room for them to wear bulky spacesuits and the associated life support equipment. This unfortunately led to the deaths of the Soyuz 11 cosmonauts during re-entry into the Earth’s atmosphere. Although the spacecraft landed back on Earth successfully, the cosmonauts died of lack of oxygen when a faulty valve caused all the air to escape from their capsule. Had they been wearing spacesuits they would have survived. 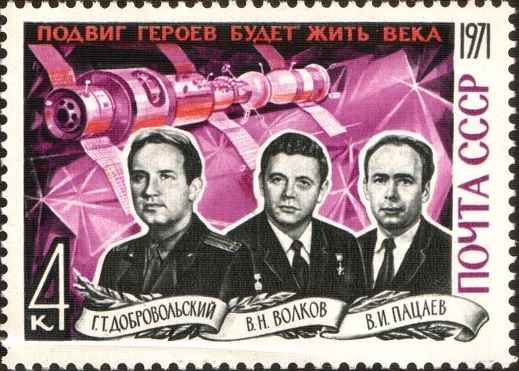 Commemorative Soviet four kopek stamp showing the Soyuz 11 spacecraft docked to Salyut 1 and the ill-fated crew. After Salyut 1, the Soviets launched six further Salyut space stations, the final one Salyut 7 being launched in 1982. Salyut 6 and Salyut 7 had an additional docking port to allow unmanned spacecraft to bring supplies. This enabled cosmonauts to stay in the station for longer durations. Cosmonauts in Salyut 6 and 7 could remain in space for up to seven months at a time. In 1973 the American launched their own space station, Skylab. Like Salyut, Skylab was a single module structure requiring no assembly in orbit. 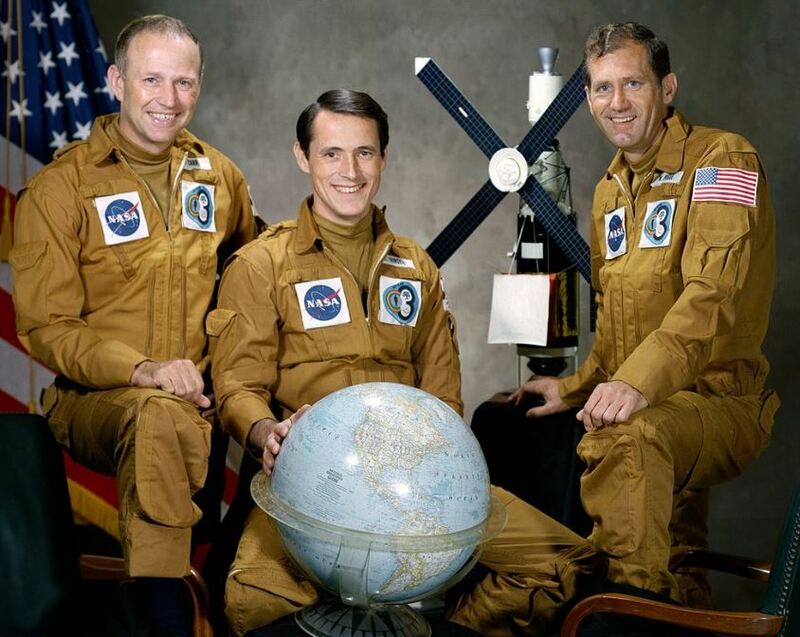 Skylab was visited by three separate missions and the final crew stayed for 84 days. After the last crew had left, Skylab was abandoned and America launched no further space stations. With a limited budget, the focus of the American manned space programme was on developing the Space Shuttle. The final Skylab crew – image from NASA. A model of Skylab is in the background. In 1986 the next advance in space station design took place when the Soviet Union launched Mir. Mir was too large to launch into orbit in one go. It was assembled from seven different modules, each launched into orbit separately. Between 1986 and 2000 twenty-eight different manned spacecraft visited Mir. In a new era of international collaboration Mir was visited by travellers from nations other than the Soviet Union. 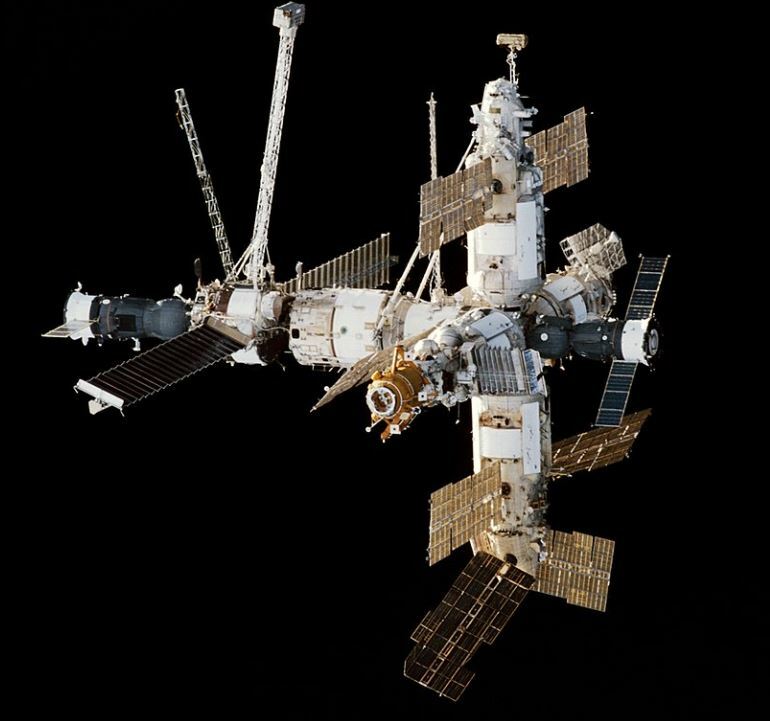 The record for the longest time a human has spent continuously in space, 438 days, was set aboard Mir in 1994 -1995 by Valeri Polyakov and still stands today. I suspect that, as more becomes known about the negative effects of long duration spaceflight on the human body, this record will not be beaten for a long time. During the early 1980s many in the US government were concerned that the Soviet Union was clearly ahead of America in long-duration manned spaceflight. At this time, the Space Shuttle programme was well over-budget, years behind schedule and the shuttle could only support astronauts staying in space for a few weeks. In his 1984 State of the Union address, President Ronald Reagan announced that America would built its own space station within the decade. It was later given the name ‘Freedom’, and was intended to give America a permanently-manned presence in space. Large space programmes nearly always turn out to be more complex and expensive than initially expected. 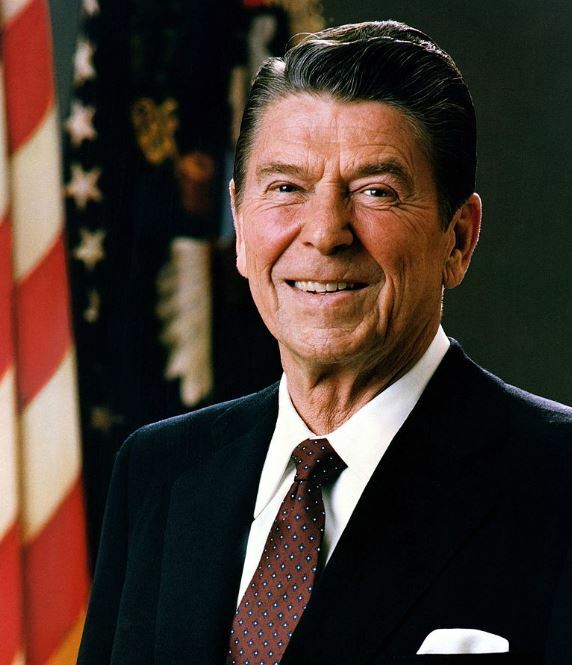 When Reagan made his announcement, America had already committed a large amount of money to the Space Shuttle programme (which would eventually cost, in 2018 dollars, over $200 billion). During the late 1980s and early 1990s, as design work on Freedom proceeded, the costs began to escalate, and the deadlines slipped. To try and bring the project back on track its scope was cut and, to reduce the cost to the US taxpayer, discussions were had with Europeans nations about bringing them in as partners. In the end, Congress would not approve the money to carry Freedom forward and the project was stopped. However, by the early 1990s the political climate had changed, with the end of the Cold War and the Soviet Union having ceased to exist. So, rather than being rivals in space, the Russian and American governments decided in 1993 to collaborate in the building of the next space station. They were joined by Japan, Canada, Brazil and the countries from the European Space Agency (ESA). 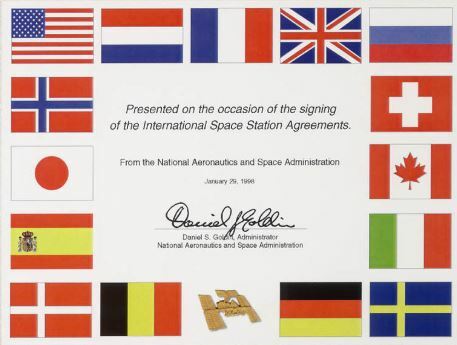 January 29, 1998 was an important milestone for the International Space Station. On this date senior government officials from 15 countries met in Washington and signed agreements establishing the framework for cooperation on the design, development and operation of the International Space Station. As discussed in my previous post, in the November after the agreement was signed the first module of the ISS, Zarya, was launched. Two years later, in November 2000, the first crew arrived, and the ISS has been manned ever since. 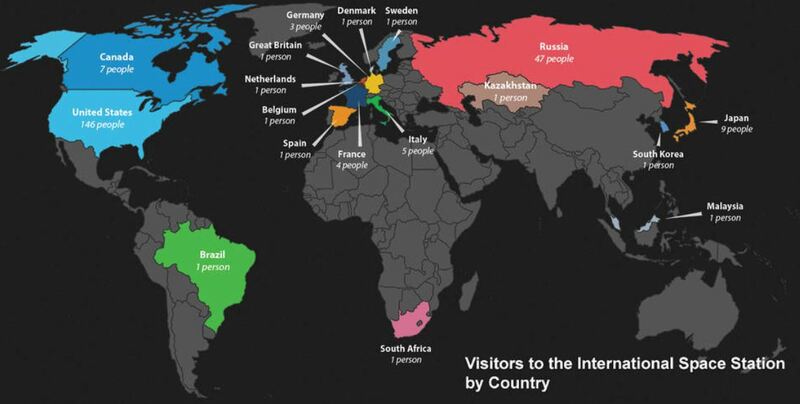 Since that date, a total of 232 different individuals have visited from 18 different countries. 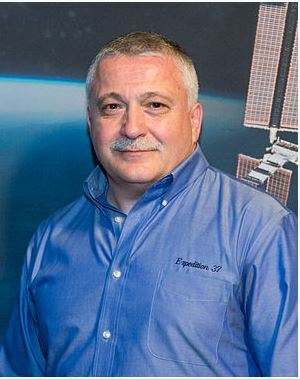 A number of them have been fortunate enough to have visited the ISS two or more times and the Russian cosmonaut Fyodor Yorikiri, shown below, holds the record for most visits having been there on five occasions. One country missing from the list of countries involved in the ISS is China. From the beginning, at American insistence, it has been excluded from any participation in the ISS. The reason is that America fears the military nature of the Chinese space programme. In 2011 Congress passed a law prohibiting any official American contact with the Chinese space program, citing national security concerns. This policy has hardened over recent years and NASA currently prohibits any of its engineers or scientists from working with China. As a result, China is developing its own space station as part of its manned space programme. China has already successfully launched two small single module space stations, Tiangong 1 and 2, which have been visited by Chinese astronauts. It is planning to launch a much larger space station in 2022 and the facility will be open to foreign astronauts. Interestingly, the European Space Agency already has an agreement with China to send astronauts to the Chinese space station once it is operational. Details are sketchy at the moment, but the new Chinese space station is expected to consist of a core module and two laboratory cabins, large enough to accommodate three to six astronauts. Spending on the early design work on Freedom, some of which became used in the ISS, started in 1985. It is unclear how much of this early work should be included. Also, this spending in the earlier years needs to be heavily adjusted upwards for inflation. Much of the ISS was built by ferrying components with the Space Shuttle. So, in addition to the costs of the components, the costs of the 36 Shuttle missions, which cost $1.6 billion EACH, should be taken into account. The total contribution by the Soviet Union, and its successor state Russia, is unclear. When the ISS was nearing completion a study by Lafleur in 2010, often quoted by the US media, estimated that the total cost (in 2010 dollars) of the ISS from 1985 to 2015 would be $150 billion. This equates to $175 billion in today’s money. Although Brazil signed the ISS treaty, it later withdrew from the programme and Lafleur ignored its small contribution. I think that although the true cost of ISS will never be accurately known, one thing that it is certain is that it is the most expensive single structure ever built by mankind! I hope you’ve enjoyed this post. In my next post I’ll talk about the future of the ISS. How long will the US taxpayer continue to fund it? What will be its replacement? To find out more about the Science Geek’s blog, click here or at the Science Geek Home link at the top of this page. Lafleur, C (2010) Costs of US piloted programs, Available at: http://www.thespacereview.com/article/1579/1 (Accessed: 27 Sept 2018). Next Post Soyuz – What next? The lifetime cost of the ISS (construction and operation) is unquestionably going to be immense – probably the larger proportion is the construction. Another comparison I’m wondering about is the cost of the ISS as a percentage of the wealth (GDP) of the nations that contributed – obviously almost impossible to calculate for the reasons you’ve outlined. However, even an estimate would enable a rough comparison with (say) the cost to the Egyptians of building the pyramid of Cheops, versus the total economy of Egypt at the time, or of Göbekli Tepe to the people who built it (as they were likely hunter-gatherers, that’s probably huge as a proportion of their available surplus). The other thing to bear in mind is that each year the ISS remains in orbit, NASA allocates roughly half of its total human space flight budget to ISS operations. – This limits the its ability to fund development of systems needed to visit destinations beyond low Earth orbit. Thanks for all that! We have Tim Peake’s capsule at Peterborough at the moment (until November) in an exhibition. Great ! Just of our interest have you been able to see it? I always thought it was odd that China was excluded from the I.S.S. I wasn’t aware that their space program had a strong military component, but if that’s true I guess it makes a little more sense.